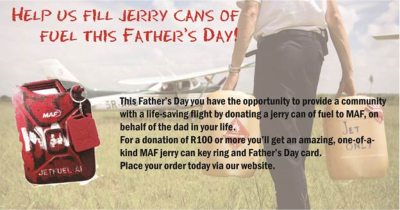 You can help fund a life-saving flight on behalf of the dad in your life! For young children a father is a real life superhero who is able to provide the protection they need. But when a family lives in the middle of the jungle without direct access to life-saving health care, the superhero needs to rely on the help of another. 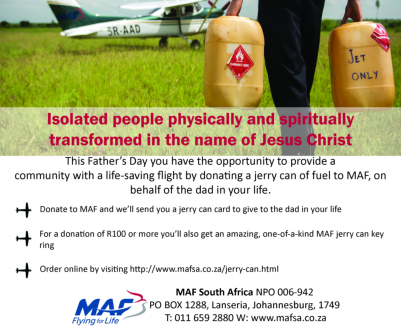 Mission Aviation Fellowship (MAF) operates in 25 developing countries including Papua New Guinea (PNG) where many remote villages can only be reached by light aircraft or on foot. As a result, air travel is the single most important form of transport and many of the local clinics aren’t able to treat severe medical conditions which means MAF provides a critical medivac service to these isolated communities. MAF’s pilot, Captain Mike Davis, recently helped save the life of a four year old girl named Frieda. She had been sick for three weeks with Acute Flaccid Paralysis and had become paralysed from the neck down. It affected her respiratory muscles and she was unable to breathe on her own. In a situation like this a father would do anything to save his child’s life, even if it means helping her breath via manual ventilation. Captain Davis managed to get Frieda from the Kudjip Mission Hospital in the Jiwaka Province to Port Moresby’s General Hospital, which has no linking roads and can only be reached by air. Frieda’s parents and a team of four medical staff, including Dr McCoy a missionary doctor, all assisted with keeping her alive by the means of manual ventilation during the hour long flight. Her father was especially concerned for his little girl and wouldn’t let go of the stretcher she was lying on for the entire flight. MAF and the mission hospitals in PNG have a strategic partnership whereby MAF subsidises its flight costs and the hospital staff occasionally pay for the balance themselves, but inthis case the hospital’s funding for non-Health Department medevacs had been depleted. Dr McCoy realised that Frieda’s parents had no money and, being a father himself, was moved by Frieda’s dad’s love for her, so he arranged to cover most of the cost of the flight. Thankfully Frieda survived due to the excellent care she received from Port Moresby’s General Hospital.